Minnesota Xtreme offers competitive cheerleading teams for athletes who are looking to participate in a sport that is challenging both mentally and physically. Competitive cheerleading is a multi-faceted sport which develops life long habits for good health and development of cornerstone character traits such as teamwork, sportsmanship, discipline, hard-work and accountability. We have teams for ages 4 and up and for most ability levels. Our teams compete locally, regionally and nationally depending on the team. All Star Prep and Novice are newer divisions in the competitive cheerleading industry. They were started to increase enrollment in All Star Cheerleading by offering lower time and financial commitment levels compare to Elite All Star teams which practice and compete nearly year round. Our All Star Novice and Prep teams practice once weekly with an additional tumbling class included in tuition. All Star Novice and Prep teams compete based on age and skill. All Star Novice follows similar level rules as All Star Elite teams with a couple of exceptions. Novice teams are judged on a standard rating system as opposed to being scored against other teams they compete against. The routine they perform is 1 minutes and 30 seconds in length as opposed to 2 minutes and 30 seconds for All Star Elite. All Star Prep teams have a different level system. The first number in their level designation is the building skill level. The second number is the tumbling skill level. So for instance, Level 3.1 is level 3 building skills, level 1 tumbling skills. The skills allowed at these levels are similar to those allowed at All Star Elite with some exceptions. All Star Prep routines are 2 minutes in length and are scored on a 100 point system compared to other teams in their division. *An athletes age for the competitive season is based on their age as of August 31st of the current season. All Star Novice and Prep teams compete a routine which is choreographed to music. 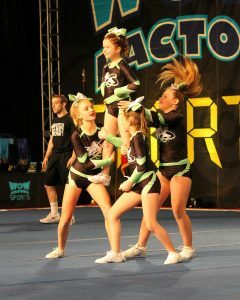 Skills used is routines include stunting, tumbling, jumps, motions, dance and creative transitions and visuals. Routines are performed on a 54′ x 42′ spring floor. In order to compete at any USASF sanctioned event, all athletes must be current members of the USASF. The USASF is the governing body of All Star Cheerleading in the United States. Minnesota Xtreme strictly adheres to the rules and guidelines of the USASF. We also promote good sportshanship and fair play and all standards set forth by the USASF. For further information or to join a team please call us at 952-239-2561 or email us at info@mxallstarcheer.com.